From Random Radio Jottings a Happy Christmas to all my readers. Thank you for your continued support. For the last three weeks over on Facebook and Twitter I've been taking you back to Christmases past. Here are those Christmas Radio Times covers, and more, again. Back in 2012. In the week that the BBC is broadcasting the Festival of Nine Lessons and Carols in High Definition Surround Sound I’m reminded of the experiment with quadraphonic sound back in the mid 1970s. In April 1977 the Radio Times advised listeners how to set up their hi-fi equipment to hear the quad broadcasts during the year long experiment. The system used existing stereo transmissions but required the purchase of either a quadraphonic decoder or a second amp and set of speakers. Assuming you managed to get yourself wired for sound you could hear Proms concerts, Radio 1 In Concert, a production of The Tempest and the BBC Radio Orchestra in glorious surround sound. That Christmas the Festival of Nine Lessons and Carols was also a quad transmission. Across the 1977 festive season you could also enjoy quad broadcasts of Alan Freeman’s Saturday afternoon rock show, a production of As You Like It, Cliff Richard In Concert and on Radio 1 Jonathan King Rules. Recordings played in quad on the Radio 1 shows were preceded by this effect. Writing in the Radio Times in May 1977 Director of Programmes Douglas Muggeridge accepted that “few people will be able to take full advantage of the quadraphonic transmissions at the outset of the experiment.” The cost to the BBC was estimated at £10,000 to £15,000. Listeners also complained that the corporation needed to extend its stereo network first before embarking on the broadcasts. Remember that at the time the provision of stereo VHF was still not complete and that Radio 1 still shared VHF frequencies with Radio 2. So, 34 years later, plug your PC into your surround sound system and plonk your headphones on and listen to these version of the Christmas concert provided on the Radio 3 blog. Read more about quad here or download the BBC’s 1977 research paper on the subject here. For many years the peal of bells on Christmas morning provided the start to the day’s broadcasting. This is no longer the case. So let me take you back to Christmas 1977 and Paddy O’ Byrne opening up both Radio 1 and Radio 2 with the bells of the Church of the Nativity in Bethlehem. You’ll also hear the start of John Dunn says Happy Christmas. 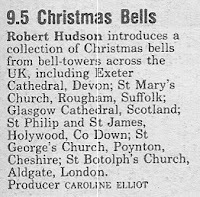 And from the days when Radio 4 had a half-hour Christmas morning programme called Christmas Bells this recording, taken from a poor quality tape, features veteran broadcaster and commentator Robert Hudson. 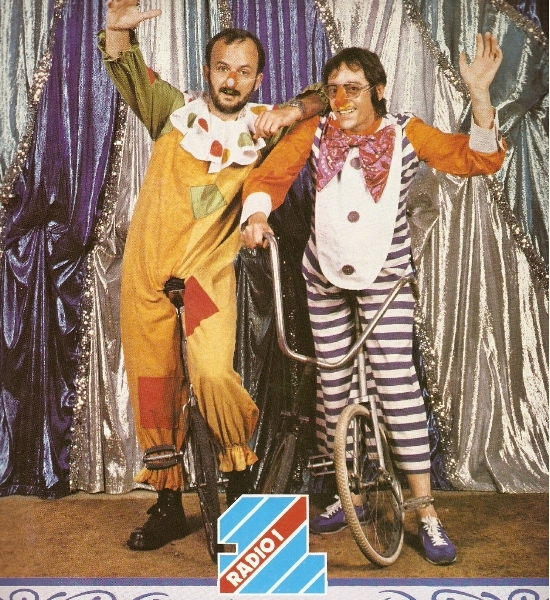 The programme was broadcast in 1983. 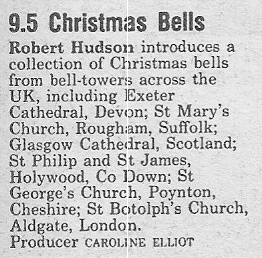 Christmas Bells was last broadcast in 1986. 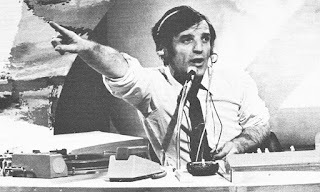 In contrast to the relaxed presenting style of Tom Browne in the 1976 Remembered post here’s another slice of ’76, this time with Alan Freeman. This is an edited version of Pick of the Pops as broadcast on Radio 1 on 6 December 1992. I don’t know if you’ve been watching the BBC Four repeats of Top of the Pops this year. 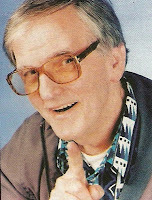 The repeats started with shows from 1976, the first year in which there is a more complete archive of programmes. I know if may not be the best year musically speaking. It certainly seemed to have more than its fair share of novelty acts and one-hit wonders. But it’s the year that I started to buy singles and when I really got into music and radio. So for me it’s a great year! I don’t actually remember the first record I bought, but one of the first was the hit song of the summer, Don’t Go Breaking My Heart by Elton John and Kiki Dee. I still have the record, see the scan below. I started recording songs from the chart show with my little tape recorder, at that time presented by Tom Browne, back in 1975 but in the following year I was consistently listening to the charts and keeping the records that I liked. 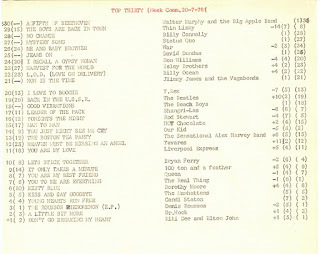 On 2 January 1977 I recorded the rundown of the best selling twenty singles of 1976. My recording has one link and the countdown missing but I’ve reinstated these from another source as well as adding Tom’s closing announcement. Preceding the show is a short trail that was heard during the week. So let’s go back in time (frighteningly its 35 years ago) as Tom Browne goes on air at 6 p.m. As for Elton and Kiki, they made it to number two. 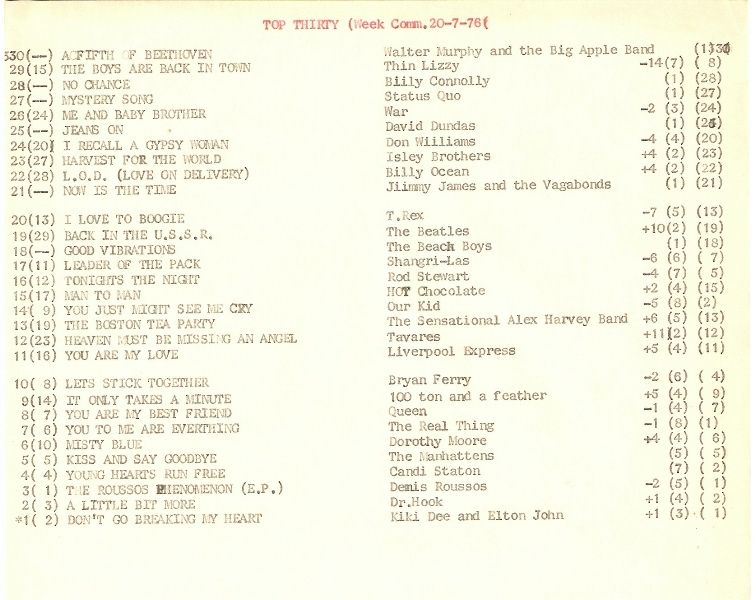 I was very much into following the singles charts at that time and for a while wrote out the weekly chart positions. I’ve long since thrown or lost those pieces of paper but I have found a handful of charts that I actually went to the trouble of typing up, here’s one from July 1976. 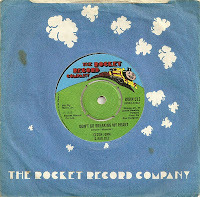 Back in 1976 Tom Browne only played the Top 20 on Sunday but when the chart was announced on the Tuesday, at the time during Paul Burnett’s lunchtime show, you got the Top 30. There was a time when the Yuletide telly appearance of David Jason was as regular an occurrence as the untouched box of Newberry fruits and the DFS Boxing Day sale. Mind you he’s back on BBC1 this Christmas in The Royal Bodyguard. Rightly loved an applauded for his performances as Del Boy, Frost and Pop Larkin et al, Jason’s radio hinterland is often overlooked. His versatility in ‘doing voices’ was first put to good use in Radio 4’s weekly satirical sketch show Week Ending (1970-1998). David was a regular on the show between 1979 and 1982 alongside Sheila Steafel, David Tate and Bill Wallis. I plan to post about Week Ending in 2012. Doing straight impressions David was a semi-regular on Radio 2’s The Impressionists and you can hear an edition of that programme here. From 1977 to 1981 David also had his own Radio 4 series The Jason Explanation of… , with a different theme explored in sketches and song in each programme. 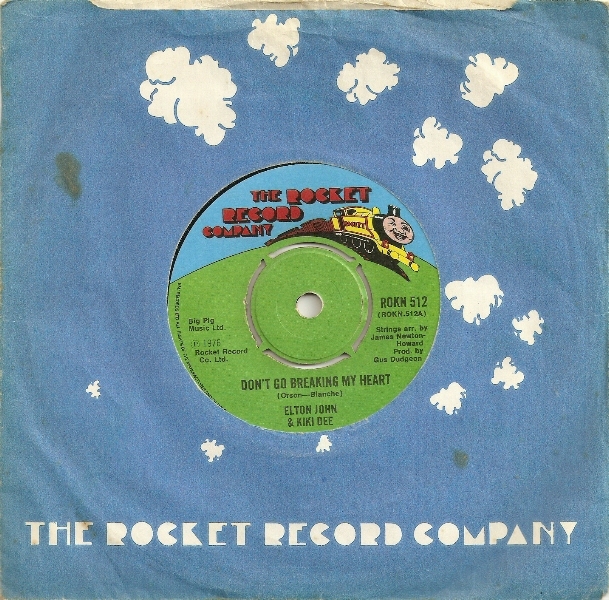 This is the 1981 Christmas offering The Jason Explanation of the Festive Season as broadcast on 25 December. The programme has an incredible comedy pedigree. Alongside Jason at the mic is Sheila Steafel and Jon Glover (also on Week Ending and provider of voices on Spitting Image). Writers include Any Hamilton and Guy Jenkin (TV’s Drop the Dead Donkey and Outnumbered), John Langdon (a regular writer for Rory Bremner), Peter Hickey (creator of Trivia Test Match), Jon Canter (later Lenny Henry’s regular collaborator), Tony Sarchet (Delve Special on the radio and This is David Lander on Channel 4) and Geoffrey Perkins (Radio Active and BBC Head of Comedy). The producer is Jimmy Mulville (Who Dares Wins and co-founder of Hat Trick Productions). 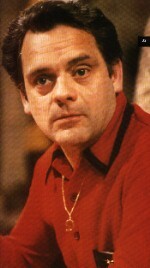 You can also hear David Jason on the radio this Christmas Day presenting classic comedy clips on BBC Radio 2 at 6 p.m. There are a couple of programmes celebrating the life of Sir Jimmy Savile that are worth looking/listening out for this Christmas. In this intimate and revealing programme, Radio 2 gives iconic broadcaster Sir Jimmy Savile the last word on his remarkable life. Using newly discovered - and mostly never heard before - archive of his final in-depth interview recorded in February 2011, plus other rare and forgotten interviews given by Sir Jimmy, this programme understands the man who by his own admission was "odd". From reading telegrams to those who'd lost loved ones in the Second World War, his relationship with his mother ' The Duchess', his charity work and his life in the limelight - Sir Jimmy reflects on his life and even admits when asked about his own mortality, he's not going anywhere. 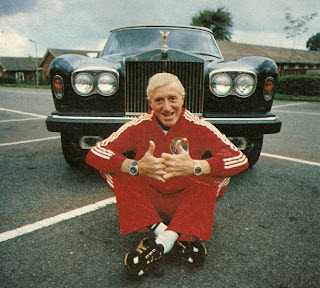 From the launch of Top Of The Pops, to Jim'll Fix It, plus his attitude towards fame and fortune, this is the life of Sir Jimmy Savile as seen and experienced by the man himself. An affectionate tribute to Jimmy Savile via the BBC archive courtesy of Top of The Pops, plus rarely seen footage of Clunk Click, the Saturday night entertainment show which eventually made way for his series Jim'll Fix It. Read more about Jim’ll Fix It on my other blog. Just a reminder that last Christmas I posted a couple of seasonal programmes from my BBC Radio 2 archive. Jimmy Young Sings for Christmas features JY, the Mike Sammes Singers and the BBC Radio Orchestra conducted by Neil Richardson. This was not, as I posted at the time, the last programme to feature Jim's smooth singing tones, similar programmes went out on Christmas Day in 1980 and 1981. This Radio 1 show dates from a time when the station was also the home of some cutting edge comedy. Victor Lewis-Smith, Armando Iannucci, Julian Clary and Loose Talk featured in the schedules of the early 90s. The Knowledge was a four-part spoof documentary narrated by Alan Freeman, this recording is of the one-off seasonal version, The Christmas Knowledge, broadcast on 30 December 1993. What makes this such a hoot is not just the script but Fluff’s reading of it, a true tour de force. There’s also a bit of fun to be had against his Radio 1 colleagues including “beardy Scouser” John Peel. The programme also features Tim Whitnall, Bernadine Corrigan, David Howarth, Peter Serafinowicz (man of voices including Darth Maul and Terry Wogan) and Julie Gibbs. Music is by Murray Gold (of Doctor Who fame) and the script written by Andy Riley (Bunny Suicides) and Kevin Cecil (who would both later write Hyperdrive and Robbie the Reindeer). The Producer is Gareth Edwards. 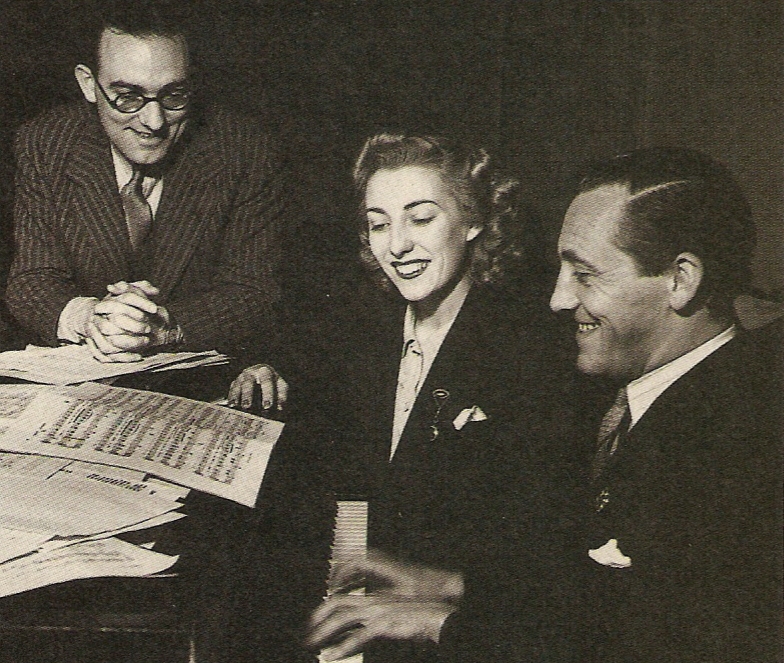 Memories of Christmas some seventy years ago in this “nostalgic medley of radio” presented by Christopher Andrew. This was the period of Lord Haw-Haw, Churchill, De Gaulle, The Brains Trust, Vera Lynn (pictured above), blackouts and rationing. The programme was broadcast on Radio 4 on Thursday 24 December 1981. Also from 1941 is this Crown Film Unit Christmas Under Fire directed by Harry Watt. December, so time to get hold of your calendar for next year. Why not buy the Radio 1 calendar with “twelve stunning pictures of all your favourite DJs, in full colour”. OK, so it went out of production sometime in the 80s. 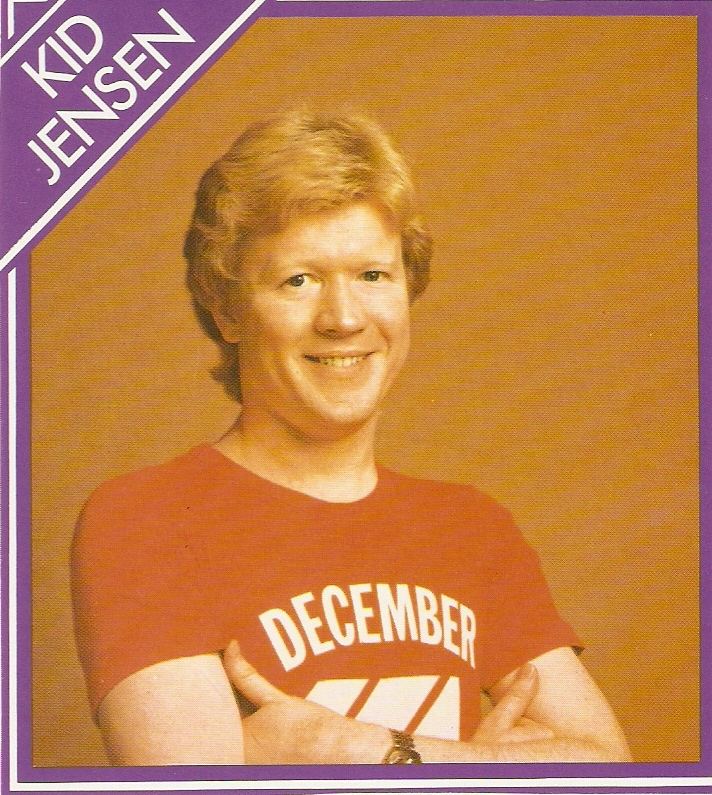 But back in 1976 here’s new recruit Kid Jensen advertising the 1977 calendar available for just £1. 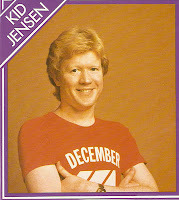 This promo is for the 1983 calendar – with thanks to whoever first posted it on Jinglemad. The voiceover here provided by Michael McClain. 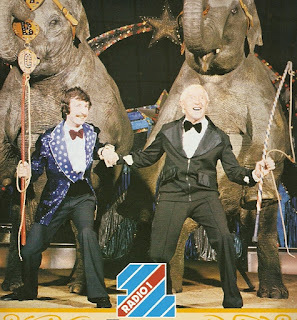 With pictures ranging from straight forward portraits to increasingly bizarre situations, the 1981 circus theme is particularly tacky, the calendar was just part of the station merchandising from Radio 1 Offers. Look out for more goodies in the New Year. Charles Dickens at Christmas is as much a festive tradition as the 3 p.m. address from The Queen and a Morecambe & Wise repeat. In this Radio 4 programme, Humbug!, the writer and broadcaster Brian Sibley explores the popularity of A Christmas Carol. The tale that is “more widely known than read”, is part of the fabric of Christmas; a Dickensian Christmas offering a familiar and comforting vision at odds with the poverty and destitution of 19th century London that inspired the story. In the programme you’ll hear performances and readings from Lionel Barrymore, Roy Dotrice, Albert Finney, The Goons, Alec Guinness, Patrick Magee, Mr Magoo, Daniel Massey, Walter Matthau, Ralph Richardson, Leonard Rossiter, Scrooge McDuck, Paul Schofield, Alastair Sim and Orson Welles. Humbug! was first broadcast on BBC Radio 4 on Tuesday 22 December 1987. The readers are Norman Bird and Diana Olsson. The producer Glyn Dearman. The story of A Christmas Carol has been retold many times. 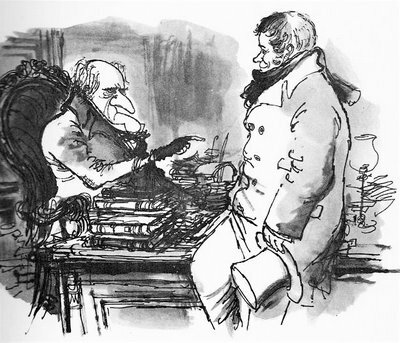 The BBC radio version starring Michael Gough and Freddie Jones is repeated on Christmas Day over on Radio 4 Extra. The best cinema version has to be The Muppet Christmas Carol and I see that in a Radio Times poll it came out as the second favourite festive film behind It’s A Wonderful Life – a film I defy you to watch without shedding a tear at the end. Dickens’s story also features in three other films in the Top 50: the wonderful Alastair Sim as Scrooge at No.9, Bill Murray’s retelling as Scrooged at No. 13 and Jim Carrey in A Christmas Carol at No. 14. There’ll be heaps more Dickens over the next year as 2012 sees the 200th anniversary of his birth. Read more on the Dickens 2012 website. 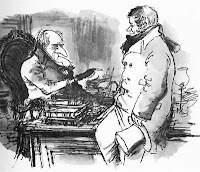 More about Scrooge on Brian Sibley’s blog from where I downloaded the Ronald Searle illustration at the top of this post. It’s the countdown to Christmas and over the next three weeks or so I’ll be bringing you some seasonal radio treats. Sung Christmas jingles are rarely heard on UK radio these days. So let’s fire up the audio DeLorean and firstly hear some of the jingles that BBC Radios 1 and 2 used in the 70s and 80s. Some of these jingles came from the Christmas Kit package produced by JAM Creative Productions. Here’s a slightly edited version of what the package offered. I’ll conclude with a Christmas jingle montage sequence put together in 2009 by Wixy1360 over on Jinglemad. I think the audio may have disappeared from that site during the overhaul they had to make earlier this year but in case Ian does decide to re-post it here’s just a short sequence from it. In the meantime if you follow Random Radio Jottings on either Facebook or Twitter then each day until Christmas I’ll be bringing you a Radio Times Advent Calendar. Featuring Radio Times covers from my own collection I’ll be covering the years 1999 to 1976. For another radio-themed advent calendar head over to DX International written by fellow blogger Chrissy Brand.